Hepatocytes provide an integrated model to study drug metabolism and disposition. As a result of a loss of polarity or a significant decrease in the expression of enzymes and transporters, suspended and sandwich-cultured hepatocytes have limitations in determining hepatocellular drug concentrations. Underprediction of the extent of glucuronidation is also a concern for these hepatocyte models. Faldaprevir is a hepatitis C virus protease inhibitor in late-stage development that has demonstrated significant liver enrichment in in vivo rat models based on quantitative whole-body autoradiography (QWBA) and liver-to-plasma area under-the-curve ratio. In bile duct cannulated rats, the primary biliary metabolite was a glucuronide. Owing to ethical concerns, it is difficult to assess liver enrichment in humans, and a lack of in vitro and in vivo correlation of glucuronidation has been reported. The current study was conducted to verify whether a hepatocyte model, rat HepatoPac, could overcome some of these limitations and provide validity for follow-up studies with human HepatoPac. With rat HepatoPac, liver enrichment values averaged 34-fold and were consistent with rat QWBA (26.8-fold) and in vivo data (42-fold). In contrast, liver enrichment in suspended hepatocytes was only 2.8-fold. Furthermore, the extent of faldaprevir glucuronidation in HepatoPac studies was in agreement with in vivo results, with glucuronidation as the major pathway (96%). Suspended rat hepatocytes did not generate the glucuronide or two key hydroxylated metabolites that were observed in vivo. Overall, our studies suggest that HepatoPac is a promising in vitro model to predict in vivo liver enrichment and metabolism, especially for glucuronidation, and has demonstrated superiority over suspended hepatocytes. Faldaprevir (BI 201335, FDV) is an inhibitor of the hepatitis C virus (HCV) NS3/4 protease and is currently in development for the treatment of HCV (Sulkowski et al., 2013a,b). Based on an in vivo rat study, faldaprevir was highly enriched in the target organ, liver, with a liver-to-plasma area under-the-curve ratio of 42 (White et al., 2010). In addition, faldaprevir was extensively glucuronidated in the rat as evidenced by significant levels (37.6% of faldaprevir-derived radioactivity) excreted in bile in a rat [14C] absorption, distribution, metabolism, and excretion (ADME) study described herein. Recent regulatory drug-drug interaction (DDI) guidelines have focused on providing a better understanding of the mechanisms of disposition and metabolism of drug candidates and relative clearance pathways, such as the European Medicines Agency (EMA) guideline on the investigation of drug interactions (http://www.ema.europa.eu/docs/en_GB/document_library/Scientific_guideline/2012/07/WC500129606.pdf) and the Food and Drug Administration (FDA) draft guidance for industry: drug interaction studies (http://www.fda.gov/downloads/Drugs/GuidanceComplianceRegulatoryInformation/Guidances/ucm292362.pdf). The EMA guidline on DDI has specifically pointed out that liver enrichment should be taken into account in DDI estimations, if available data indicate that the drug may accumulate in hepatocytes. The importance of understanding intracellular drug concentration in the liver, when evaluating drug efficacy, toxicity, and DDI potential, is gaining increased attention (Korzekwa et al., 2012; Chu et al., 2013). For example, Chu et al. (2013) reviewed a number of in vitro and in vivo model systems (such as membrane vesicles, recombinant proteins, suspended hepatocytes, sandwich-cultured hepatocytes, perfused liver, and in vivo animal and human studies) used to assess hepatocellular concentrations of drugs in a quantitative manner. Methods for directly measuring intracellular concentrations, as well as modeling approaches to estimate the unbound fraction, were also presented. As highlighted by the authors, each currently available experimental model has its limitations in determining hepatocellular drug concentrations. For example, loss of polarity and a significant decrease in the expression of enzymes and transporters are concerns for suspended and sandwich-cultured hepatocytes, respectively. HepatoPac is a hepatocyte coculture consisting of islands of hepatocytes surrounded by murine stromal cells (3T3-J2 fibroblasts) that has demonstrated long-term stable expression of drug-metabolizing enzymes (DMEs) (both phase 1 and 2), as well as canalicular efflux transport over an extended period (Khetani and Bhatia, 2008; Wang et al., 2010; Chan et al., 2013; Ukairo et al., 2013). In addition, human HepatoPac has been validated for uptake transporter function of organic anion-transporting polypeptides and sodium taurocholate cotransporting polypeptides (Ramsden et al., 2014). Thus, HepatoPac provides an integrated system that enables simultaneous evaluation of the contributions of uptake, metabolism, and efflux to the overall clearance of drugs. The expression of active uptake and efflux transporters makes HepatoPac an attractive model to evaluate intracellular drug concentrations and estimate the extent of hepatocellular enrichment. The purpose of the current study was to determine whether rat HepatoPac could overcome some of the limitations of other in vitro methods in assessing hepatocyte enrichment (Chu et al., 2013) and whether the extent to which metabolic pathways observed in vivo, particularly glucuronidation, would be replicated in vitro in rat HepatoPac. In addition, since HepatoPac has been demonstrated to accurately reproduce metabolite profiles (Wang et al., 2010), there was a specific intent to validate the rat HepatoPac model by showing an in vitro to in vivo concordance for faldaprevir metabolism and disposition with a goal of using the human HepatoPac system to help delineate the mechanisms of metabolite formation for faldaprevir in humans (Ramsden et al., 2014). Rat HepatoPac cultures and proprietary maintenance and probing media were acquired from Hepregen Corporation (Medford, MA). Cultures were prepared from male cryoplateable Sprague-Dawley rat hepatocytes purchased from Invitrogen Life Technologies (Grand Island, NY). Suspended male Spraque-Dawley rat hepatocytes used to estimate liver partitioning were purchased from CellzDirect (Research Triangle Park, NC). Suspended rat hepatocytes used for preliminary metabolite identification were isolated from male Sprague-Dawley rats (250–350 g) purchased from Charles River Laboratories (Wilmington, MA). Hepatocytes were isolated using a two-step in situ collagenase perfusion method previously described (Lecluyse et al., 1994) and cryopreserved using a controlled freezing program (Houle et al., 2003). All protocols were approved by the Institutional Animal Care and Use Committee. Hepatocyte incubation medium for suspended hepatocytes was prepared with the following Ultrapure Bioreagent grade materials from J. T. Baker (Phillipsburg, NJ): magnesium sulfate 0.14 g/l, potassium phosphate, monobasic 0.16 g/l, potassium chloride 0.35 g/l, sodium choride 6.9 g/l, calcium chloride 0.15 g/l, sodium bicarbonate 2.4 g/l, HEPES 4.8 g/l, and d-glucose, 2.0 g/l, pH adjusted to 7.4 with sodium hydroxide. Trypan blue and William’s E medium were purchased from Sigma-Aldrich Corporation (St. Louis, MO). A solution of penicillin (10,000 U/ml), streptomycin (10 mg/ml), and GlutaMax (100×) were purchased from Gibco/Life Technologies (Grand Island, NY). Enhanced recovery plates and insulin, human transferrin, and selenous acid (ITS) premix were acquired from Corning Lifesciences (Bedford, MA). Faldaprevir, [14C]faldaprevir, d7-faldaprevir, IN79158 (M2a), IN79157 (M2b) and BI 203279 (faldaprevir glucuronide) were synthesized at Boehringer Ingelheim Pharmaceuticals, Inc. (Ridgefield, CT). All other reagents and solvents were of analytical grade or higher purity and were obtained from commercial suppliers. The rat HepatoPac model was prepared using cryoplateable rat hepatocytes as described previously (Khetani and Bhatia, 2008). HepatoPac cultures (5000 hepatocytes/well) were maintained in rat HepatoPac culture medium (rHCM). Culture medium was replaced every 2 days (50 µl/well) before incubation with test compounds. On day 9 post seeding, faldaprevir was prepared at 0.15 and 2.86 µM in rat HepatoPac incubation medium (rHIM; mixture of equal volume of rHCM containing 10% bovine serum and protein-free probing medium from Hepregen) and added to wells of the HepatoPac or fibroblast only plates. At various time points (up to 96 hours), the entire aliquot of medium (50 µl) was removed and quenched with 100 µl of quench solution consisting of acetonitrile/water (60:40, v:v, containing 0.1% acetic acid and 0.1 µM of an internal standard, d7-faldaprevir). These samples were designated as medium samples. The same volume (50 µl) of ice-cold blank medium was added to each well and rapidly aspirated and discarded to wash residual faldaprevir off the cell surface. The washing step was repeated. After the second wash, the same volume of blank medium (50 µl) was added to each well, the well surface was scraped with the end of a pipette tip, and the mixture of cell debris and solution was triturated three times before depositing into corresponding wells in a separate 96-well plate. These samples were designated as lysate samples and were quenched with 100 µl of quench solution (as described for the medium samples). Samples were filtered through a membrane via centrifugation at 4°C for 15 minutes, and the supernatant was analyzed by liquid chromatography tandem mass spectrometry (LC-MS/MS). All treatments were also repeated on plates containing only fibroblast feeder cells. Uptake studies using suspended hepatocytes were performed as previously described (Duan et al., 2012a). In short, reconstituted suspended rat hepatocytes (viability >85%) were incubated in hepatocyte incubation medium in an atmosphere of 5% CO2 for 10 minutes at 37°C. Faldaprevir and rat plasma were added to initiate the incubation. The final concentration of faldaprevir was 2 µM in 50% plasma. The final hepatocyte concentration was 1.6 × 106 cells/ml. Samples were incubated at 37°C for 16 minutes. After incubation, samples were centrifuged at 11,000g for 15 seconds, a 400-µl aliquot of supernatant was retained for extraction. Remaining supernatant was aspirated, and the cell pellet was resuspended in 0.8 ml of the hepatocyte wash medium (HWM = hepatocyte incubation medium without d-glucose). This step was repeated once more, and the hepatocyte pellet was resuspended in 400 µl of ice-cold HWM. The cell pellet and medium samples were extracted with 2× volume of acetonitrile containing 2% formic acid and centrifuged at 16,000g for 5 minutes. Levels of faldaprevir in the medium and cell pellet were determined by LC-MS, as described previously (Duan et al., 2012b). Faldaprevir (final concentration 10 µM) was incubated with 2.5 × 105 viable suspended rat hepatocytes, in a volume of 1 ml, up to 4 hours in William’s E complete medium containing 100 nM dexamethasone, 100 U of penicillin, 0.1 mg streptomycin, and 1% ITS premix solution in an atmosphere of 5% CO2 at 37°C. The viability of hepatocytes after reconstitution was >70%. At the end of the incubation, the reaction was stopped with 2 ml of quench containing 40% acetonitrile, 1 µM 1-naphthylglucuronide, and 0.1% acetic acid in water. A quantitative whole-body autoradiography (QWBA) study was conducted in accordance with Department of Health and Family Services, Radiation Protection Section (license no. 025-2076-01). Male Long Evans rats were given [14C]faldaprevir via gavage at a dosage of 10 mg/kg in a solution of 80% PEG400/18% water/1% TRIS/1% meglumine. Animals were sacrificed at 1, 6, 12, 24, 48, 72, 336, and 672 hours post dose. Blood (approximately 2–10 ml) was collected into tubes containing sodium heparin from all animals at sacrifice and centrifuged to obtain plasma, which was analyzed by liquid scintillation counting. Concentrations of total radioactivity in the liver were obtained from the QWBA study using a validated image analysis system. Tissue concentrations were interpolated as nanocuries per gram and then converted to nanogram equivalents per gram on the basis of the faldaprevir specific activity (10.2 µCi/mg in oral dose). Metabolic profiling of bile collected from bile duct–cannulated (BDC) Sprague Dawley rats dosed with [14C]faldaprevir was performed as part of the rat [14C]ADME studies. The animal protocol was reviewed and approved by the Institutional Animal Care and Use Committee. Briefly, each BDC rat received a single dose of faldaprevir of 10 mg/kg by oral gavage. Bile was collected into vials over dry ice predose and at intervals of 0–2, 2–4, 4–6, 6–8, 8–24, and 24–48 hours post dose. The radioactivity of the bile samples were determined by liquid scintillation counting. The 14C profiles in rat bile samples were determined by LC radio chromatography. Metabolite identification was performed by LC-MS/MS. The samples generated from HepatoPac incubations were analyzed on a 4000Qtrap (AB Sciex, Thornhill, Ontario, Canada) attached to a Waters Acquity ultraperformance LC system (Milford, MA). The aqueous mobile phase (A) and organic mobile phase (B) consisted of 95:5 (v/v) water/acetonitrile and 95:5 (v/v) acetonitrile/water, respectively. Both mobile phases contained 0.1% acetic acid. Samples were eluted through an Acquity ultraperformance LC column BEH C18 1.7µm (2.1 × 50 mm) after a 10-minute gradient with 5% B to 38% B over 1 minute at a flow rate of 0.5 ml/min, then to 51.5% B over 9 minutes at a 0.7 ml/min flow rate. Multiple reaction monitoring analysis was performed in positive ionization mode to quantify levels of faldaprevir (m/z 869.3→422.1, retention time 9.7 minutes), M2a and M2b (m/z 885.3→422.1, retention time 5.2 minutes for M2a and 5.5 minutes for M2b), faldaprevir glucuronide (m/z 1047.2 → 871.1, retention time 5.8 minutes) and internal standard d7-faldaprevir (m/z 876.3 → 429.1, retention time 9.7 minutes) using authentic standards. The linear range of the metabolite curves was established to be between 0.000488 and 1.0 µM. The linear range of faldaprevir was determined to be between 0.000488 and 4.0 µM. Metabolite identification for suspended rat hepatocyte incubations was performed in positive ionization mode using a Sciex API 3000 (AB Sciex) coupled with Agilent 1100 pumps and autosampler (Agilent technologies, Santa Clara, CA). The aqueous and organic mobile phase consisted of 95:5 (v/v) water/acetonitrile and 95:5 (v/v) acetonitrile/water, respectively. The mobile phases contained 0.5% acetic acid. Samples were analyzed by elution through a phenomenex Synergi MAX-RP column (2.0 × 150 mm; 4 µm) using a 30-minute gradient. Rat bile samples were analyzed in positive ionization mode using a 4000 Qtrap system coupled with LC-10AD pumps and an SIL-HTC autosampler (Shimadzu, Norwell, MA) to obtain structural information for faldaprevir and metabolites. Samples were eluted through a phenomenex Gemini C18 column (4.6 × 150 mm, 3 µm) over an 87-minute gradient. Liver Enrichment Determined from Rat HepatoPac. This concentration was corrected by the hepatocyte intracellular volume (0.0000324 ml for 5000 hepatocytes) to calculate the intracellular concentration (pmol/ml). A hepatocyte volume of 6.48 pl/hepatocyte was used (personal communication with Dr. Kenneth Brouwer from Qualyst Transporter Solutions (Durham, NC)). This value is in-line with other literature values (Swift et al., 2010). Liver Enrichment Generated from Suspended Hepatocytes. In Vitro Formation Rates of Metabolites Scaled to Total Liver Based on Rat HepatoPac Data. In Vivo Formation Rates of M2a, M2b, and Faldaprevir Glucuronide in the Rat. aThe percent of dose recovered in bile, displayed in Table 3. Liver Enrichment in Rat HepatoPac. Concentrations of faldaprevir, 0.15 and 2.86 µM, were selected to cover estimated free Cmax and the total Cmax, respectively, of faldaprevir observed during the [14C]ADME study in the rat (data on file, Boehringer Ingelheim Pharmaceuticals, Inc.). Nonspecific binding of faldaprevir to the fibroblast-only plates represented less than 1% of the total concentration added to the incubation and was not time- or concentration-dependent. Enrichment values were calculated after correction for nonspecific fibroblast binding. The level of enrichment appeared to reach equilibrium by 2 hours (Fig. 1). To calculate the average enrichment value, time points before 2 hours were not included. In addition, time points after 48 hours were not included because of an apparent loss of hepatocyte function after 48 hours (a reduction in the extent of enrichment and increased variability between replicates). The average extent of enrichment in rat hepatocytes was 34-fold based on the data from 2–48 hours (Table 1). Faldaprevir enrichment into rat hepatocytes determined as ratios of intracellular concentrations to medium concentrations (n = 3) or (n = 6 at 8, 12, and 24 hours). Liver Enrichment in Suspended Rat Hepatocytes. A single concentration of faldaprevir (2 µM) was added to suspended rat hepatocytes in hepatocyte medium containing 50% v/v of rat plasma to estimate liver enrichment. Both medium and hepatocyte samples were collected after 16 minutes and analyzed for faldaprevir levels. The 16-minute incubation time was selected based on an initial time course evaluation. The apparent concentration of faldaprevir in liver was estimated to be 5.6 nmol/g after correction of hepatocyte volume and assuming that 1 g of liver is equivalent to 1 ml of volume. The liver enrichment calculated from the ratio of the intracellular concentration over the measured concentration of faldaprevir in the medium (2.0 µM) was determined to be 2.8 (Table 1). Liver Enrichment Determined from the QWBA Study in the Rat. Liver tissue and plasma concentrations were determined by whole-body autoradiography at specified times after a single oral administration of [14C]faldaprevir (10 mg/kg) to male Long Evans rats. Liver enrichment was lower at earlier time points and appeared to reach equilibrium by 6 hours (Table 1). The highest liver-to-plasma ratio observed was 26.8-fold at 6 hours. Metabolite Profiling in In Vitro Incubations with Suspended Rat Hepatocytes and In Vivo Rat Bile. Two metabolites were detected in in vitro incubations of faldaprevir with suspended rat hepatocytes, and six metabolites were identified in rat bile after oral dosing. The structures of the metabolites were proposed based on their molecular ions and product ion spectra (Table 2). The fragmentation patterns and characteristic ions of each metabolite are also included in Table 2. The levels of metabolites in the bile were determined by LC-radio chromatogram and are listed in Table 3. Only the data from the 0- to 24-hour period are shown because 91% of the total absorbed radioactivity was excreted into bile over the first 24 hours (equivalent to 31.2% of dose), and only 9% of the total absorbed radioactivity was excreted into bile from 24 to 48 hours (equivalent to 3.1% of dose). Faldaprevir glucuronide was the major metabolite in rat bile (approximately 38% of drug-related material in bile), whereas M2a and M2b were minor components (2.2% combined of drug-related material in bile). The levels of all other metabolites were also low (14% combined between 10 metabolites, of which only three were able to be positively identified, and each was below 5% of drug related material in bile). In suspended hepatocytes, M2a, M2b, or faldaprevir glucuronide were not detected (Table 2). Only two amide hydrolysis metabolites were found (< 3% of the parent based on peak area estimation after 4-hour incubation). Formation of M2a, M2b, and Faldaprevir Glucuronide by Rat HepatoPac. Authentic standards of faldaprevir glucuronide and two abundant human metabolites, M2a and M2b (Chen et al., 2014), were synthesized. The levels of M2a, M2b, and faldaprevir glucuronide formed were quantified in medium and lysate samples from rat HepatoPac incubated with faldaprevir at 0.15 and 2.86 µM. The lower concentration of faldaprevir studied (0.15 µM) was too low for discernible formation of M2a and M2b. However, there was linear formation of both metabolites at 2.86 µM faldaprevir up to 48 hours (Fig. 2A). Linear formation occurred for faldaprevir glucuronide at both concentrations up to 24 hours (Fig. 2B) with a 21-fold difference in the formation rates reflecting the difference in incubation concentrations of faldaprevir (19-fold), suggesting that these incubation concentrations are in the linear portion of the Michaelis-Menten curve. Formation of M2a and M2b at 2.86 µM faldaprevir (A) and formation of faldaprevir glucuronide at two substrate concentrations (0.15 or 2.86 µM faldaprevir) (B) (n = 6) from rat HepatoPac over time. The -fold differences between substrate concentrations and formation amounts are highlighted in (B). Comparison of In Vitro and in Vivo Formation Rates of Faldaprevir Metabolites. The formation rates of M2a, M2b, and faldaprevir glucuronide with rat HepatoPac, at a substrate concentration of 2.86 µM, were scaled up to the whole liver (Table 4). Formation rates were also calculated based on metabolite levels collected in bile for 24 hours post dose (Table 4). Scaling the bile data assumed that the formation and excretion of the metabolites into the bile were linear processes over the collection period. Both in vitro and in vivo, glucuronidation was the predominant clearance pathway and formation of M2a and M2b was minor. The ratios of the formation of faldaprevir glucuronide compared with the total formation of M2a and M2b were calculated and were comparable for HepatoPac (26-fold) and in vivo (17-fold) (Table 4). In vitro systems such as hepatocytes are a valuable tool to prospectively offer insights into the disposition of a drug before administering to humans. These systems can also be used retrospectively to provide a mechanistic understanding of in vivo phenomena. As an integrated metabolic system providing a full complement of phase 1 and 2 DME capabilities, hepatocytes are becoming a primary tool in the pharmaceutical industry. This increasing reliance on hepatocytes, compared with liver microsomes, has also been promoted by a shift from a predominant role of cytochrome P450 as a clearance mechanism for drugs, to an increasing importance of other DMEs such as aldehyde oxidase (Pryde et al., 2010; Hutzler et al., 2013) and UDP glucuronosyltransferases (UGT) (Miners et al., 2010). This has partly come about as medicinal chemists develop structure-activity relationships of new chemical entities to minimize metabolism (Hutzler et al., 2013). As models are developed to better predict and/or explain the disposition of a drug and the potential for DDIs, there has been an increasing awareness of the integrated role of DMEs and drug transporters. Thus, when using in vitro hepatocyte models, it is important to adopt a hepatocyte model that has fully functional DMEs as well as transporters, for accurate reproduction of in vivo parameters. Suspension cultures provide realistic levels, and hence activities of DMEs for a limited incubation time, typically less than 4 hours and are useful for determining metabolic clearance (Gomez-Lechon et al., 2008). Whereas uptake transporters are functional in suspended hepatocytes, efflux transporters are internalized (Bow et al., 2008); therefore, this model is not capable of capturing the interplay between uptake and efflux. Sandwich-cultured hepatocytes offer a viable system to assess biliary clearance, including the activity of efflux transporters, but have diminished DMEs (Swift et al., 2010) and uptake transporters (Kotani et al., 2011; Noel et al., 2013). An important aspect for modeling in vitro to in vivo metabolism and clearance is using the appropriate concentration of substrate. The recent regulatory DDI guidelines from the EMA and FDA summarize some of these considerations, namely, Cmax versus portal vein versus tissue concentrations. The role of drug transporters, particularly uptake transporters, in altering intracellular free drug concentrations has been extensively considered (Nagar and Korzekwa, 2012; Chu et al., 2013), along with free concentrations corrected for binding to the test system (Obach, 1999). Since the liver is the target organ for HCV therapy, there was an initial interest in considering whether liver concentrations of faldaprevir would provide a more accurate assessment of efficacy. In an in vivo study in rats, liver enrichment was approximately 42-fold (Table 1), a value higher than that observed in a rat QWBA study that reached a maximum liver enrichment value of 27-fold. Results from the QWBA study reflect total faldaprevir-related radioactivity and do not distinguish between parent and metabolites. A substantially lower value for liver enrichment (2.8-fold) was obtained with suspended hepatocytes (Table 1). It is likely that other factors contribute to liver enrichment that could not be captured with suspended hepatocytes (Duan et al., 2012a). In contrast, liver enrichment values achieved with rat HepatoPac were consistent with QWBA and in vivo data, ranging from approximately 13- to 51-fold. A steady-state level of approximately 34-fold appeared to be reached by 2 hours of incubation (Fig. 1). It is expected that distribution of faldaprevir into rat liver is also a dynamic process; therefore, the average enrichment value in rat HepatoPac may be reflective of average enrichment expected to occur in the rat at steady state. This appears to be consistent with observations from the QWBA study, where maximal liver concentrations were reached at later time points. Since there is an agreement in liver enrichment between in vitro rat HepatoPac data and in vivo rat data, liver enrichment generated from the human HepatoPac model has been included in the modeling of faldaprevir metabolism in humans (Li et al., 2014; Ramsden et al., 2014). A potential limitation of the current study may be that free concentrations in the liver were not calculated. Because of the technical challenges in directly measuring unbound intracellular concentrations, it is uncertain whether the liver enrichment represents only changes in unbound concentrations or could also include differences in tissue binding. Further modeling may be able to address this issue. In general, understanding the relative contribution of glucuronidation to the overall metabolism has become increasingly important because of an increased role for UDP glucuronosyltransferases in the clearance of new chemical entities (Miners et al., 2010), as well as requests from regulatory agencies to provide these data to help in assessing the potential for DDIs (FDA, 2012). Hepatocytes are an integrated model useful for the evaluation of phase 1 and phase 2 metabolism and generally provide better prediction for the extent of glucuronidation compared with microsomes (Soars et al., 2002; Engtrakul et al., 2005). However, in some cases, significant underprediction has still been observed (Miners et al., 2006, 2010). A full profile of metabolites generated from bile samples (biliary excretion represented almost 100% of total absorbed radioactivity) as part of the rat [14C]ADME studies showed that metabolism occurs primarily through glucuronidation in the rat (approximately 70% of total metabolites) with other metabolic pathways, including hydroxylation, amide hydrolysis, and conjugation with glucose, being minor (<5% each) (Tables 2 and 3). The two predominant human metabolites, M2a and M2b, which are monohydroxylated products (Chen et al., 2014), constituted only 2.3% and 1.8% of the metabolites, respectively (Table 3). Initial metabolite profiling was performed in vitro in suspended hepatocytes. 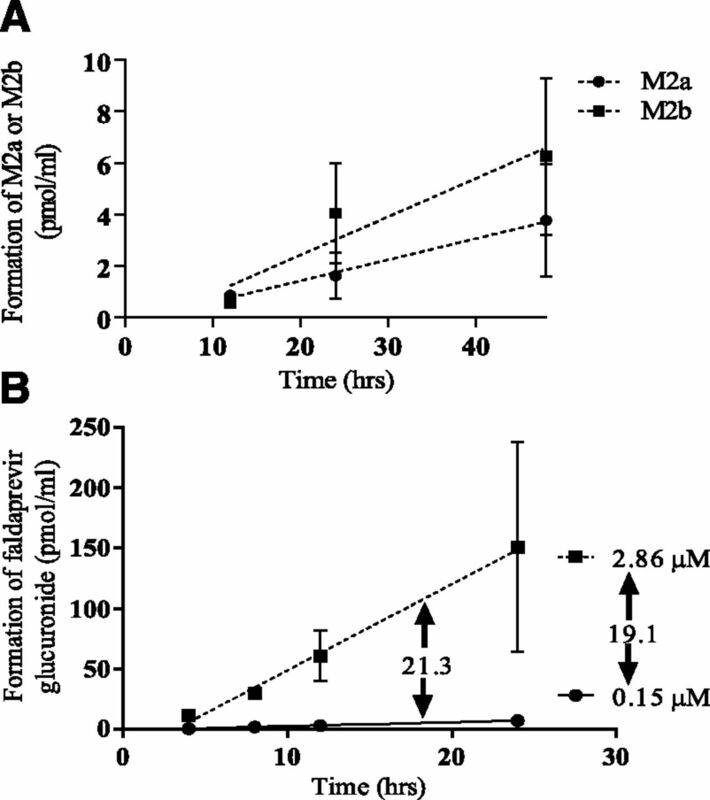 Because of very low in vitro turnover within the 4-hour incubation period, the formation of M2a, M2b, and faldaprevir glucuronide was not detected (Table 2), and only two other minor amide hydrolysis metabolites were observed. These studies indicated that suspended hepatocytes were not an appropriate cell system for characterizing metabolite formation for faldaprevir. Metabolite-formation studies using rat HepatoPac focused mainly on the three metabolites potentially relevant in humans: faldaprevir glucuronide, M2a, and M2b. The results showed that glucuronidation was 26-fold faster than the total formation of M2a and M2b in the rat HepatoPac model, a result similar to that observed in vivo (17-fold; Table 4). In addition, glucuronidation is the predominant metabolic pathway (94%–96%) compared with the formation of M2a and M2b (1.5%–3.1%) in both the in vitro rat HepatoPac study and the in vivo rat study. Thus, rat HepatoPac provided a metabolite profile similar to the in vivo results from the bile duct cannulated rats. Overall, our studies suggest that HepatoPac is a promising in vitro model, able to predict in vivo liver enrichment and metabolism, especially for glucuronidation, and has demonstrated superiority over suspended hepatocytes. Assessing the relative contribution of glucuronidation can be particularly challenging in humans because of the challenges of bile sampling and the fact that quantitative analysis of individual metabolic pathways can be complicated by cleavage of glucuronide conjugates in feces by gut bacteria (Sousa et al., 2008). Human HepatoPac may be a promising model for predicting the fraction of glucuronidation to the overall metabolism in humans. The accurate representation of in vivo metabolic profiles (especially glucuronidation) and liver enrichment by the HepatoPac model, together with the work of others (Wang et al., 2010; Chan et al., 2013), has helped to validate a hepatocyte model through which the metabolic pathways of faldaprevir in humans can be proposed (Ramsden et al., 2014). Such validation has been particularly important considering the observation that significant metabolism of faldaprevir to M2a and M2b had occurred in humans despite the fact that these two metabolites were not detected in the systemic circulation (Chen et al., 2014). The authors thank Gordon Bolger and Jianmin Duan for performing the in vitro Kp assessment and Dr. Timothy S. Tracy for scientific advice. Participated in research design: Ramsden, Tweedie, Chen, St. George, Li. (2014) Steady-state disposition of the hepatitis C NS3/NS4 protease inhibitor faldaprevir in healthy male subjects. Antimicrob Agents Chemother (in press). (2012a) The liver partition coefficient-corrected inhibitory quotient and the pharmacokinetic-pharmacodynamic relationship of directly acting anti-hepatitis C virus agents in humans. Antimicrob Agents Chemother 56:5381–5386. (2012b) Cross-species absorption, metabolism, distribution and pharmacokinetics of BI 201335, a potent HCV genotype 1 NS3/4A protease inhibitor. Xenobiotica 42:164–172. (2005) Altered AZT (3′-azido-3′-deoxythymidine) glucuronidation kinetics in liver microsomes as an explanation for underprediction of in vivo clearance: comparison to hepatocytes and effect of incubation environment. Drug Metab Dispos 33:1621–1627. (2008) An update on metabolism studies using human hepatocytes in primary culture. Expert Opin Drug Metab Toxicol 4:837–854. (2003) Retention of transporter activities in cryopreserved, isolated rat hepatocytes. Drug Metab Dispos 31:447–451. (2012) Models to predict unbound intracellular drug concentrations in the presence of transporters. Drug Metab Dispos 40:865–876. (2014) Enzyme-transporter interplay: effect on the formation and clearance of abundant metabolites of faldaprevir found in excreta but not in circulation. Drug Metab Dispos 42:384–393. (2006) In vitro-in vivo correlation for drugs and other compounds eliminated by glucuronidation in humans: pitfalls and promises. Biochem Pharmacol 71:1531–1539. (2013) Functional expression and regulation of drug transporters in monolayer- and sandwich-cultured mouse hepatocytes. Eur J Pharm Sci 49:39–50. (2014) Bridging in vitro and in vivo metabolism and transport of faldaprevir in human using a novel co-cultured human hepatocyte system, HepatoPac™. Drug Metab Dispos 42:394–406. (2002) In vitro analysis of human drug glucuronidation and prediction of in vivo metabolic clearance. J Pharmacol Exp Ther 301:382–390. (2013) Long-term stability of primary rat hepatocytes in micropatterned cocultures. J Biochem Mol Toxicol 27:204–212.